How two little wheels spun a revolution in dating, fashion, medicine, and space travel. 1. IT REVOLUTIONIZED HOW PEOPLE HOOK UP, A CENTURY BEFORE TINDER. 2. IT SHOWED THE WORLD THAT AFRICAN AMERICANS BELONGED. Fifty years before Jackie Robinson broke baseball’s color barrier, Marshall “Major” Taylor was a star of professional track racing, which at the turn of the 20th century was the most popular sport in America. Taylor won his races with bulletlike bursts while fending off attacks from white riders. He outrode them with quiet defiance, setting seven world records. 3. IT GAVE US THE NATION'S FIRST PAVED HIGHWAYS. Country roads of the 1890s were the stuff of nightmares, or, as The New York Times put it, “a morass in Spring, a Sahara in Summer … frozen stiff in later Autumn, and a slough whenever there is a thaw in Winter.” Urban roads—many of which were covered in wood—were smoother, but cyclists wanted asphalt. They got their wish via the League of American Wheelmen, which used its 100,000-plus members to agitate for the nation’s first state-funded paved roads in 1898. 4. IT DEMONSTRATED THAT SPACE IS SAFE FOR ASTRONAUTS. In 1973, the Skylab space station crew became the first people to pedal in space (on stationary bikes). In previous trips, voyagers experienced changes in heart rate and blood pressure, and scientists wanted to know how zero gravity affected the cardiovascular system, especially during heavy exertion. After collecting data over 171 days, the scientists concluded it was safe for astronauts to work in space for extended periods of time. 5. IT EMANCIPATED WOMEN FROM THE HOME (AND THEIR WARDROBE). 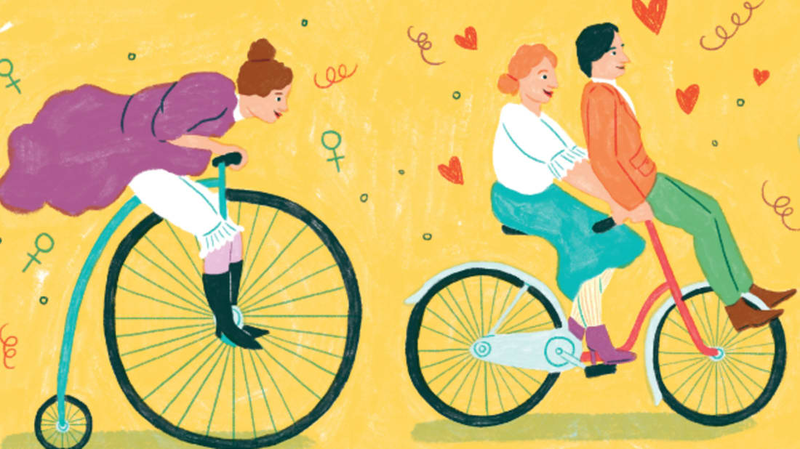 The cycling craze hit America in the 1880s, prompting women to break with Victorian-era mores by leaving their homes, alone, to pedal down streets—unchaperoned! Not only did women love the freedom, they loved the dress, ditching heavy skirts for bloomers to work the pedals. 6. IT HELPED HUNDREDS OF JEWS ESCAPE THE HOLOCAUST. When Gino Bartali returned to Italy after his 1938 Tour de France win, he was expected to dedicate the honor to Mussolini and support the fascist regime. Instead, he harnessed his talents for the Resistance. Bartali helped Jews escape the country, carrying counterfeit identity papers in the frame and handlebars of his bicycle on “training rides.” If stopped by police for search, he’d ask them not to touch his “specially calibrated” bicycle. Bartali eventually went into hiding, but by then, he had cycled thousands of miles to help hundreds escape. 7. IT BROUGHT LIFE-SAVING CINEMA TO PEOPLE IN REMOTE PLACES. In 2013, a charity wanted to screen educational films in Malawi to spread info on HIV prevention, modern farming, and other issues. But most villages lacked electricity or gas for a generator. Enter Colin Tonks of Electric Pedals, who built a pedal-driven cinema that fits in two backpacks and weighs less than 40 pounds—perfect for toting to remote spots. 8. IT CREATED THE PERFECT URBAN AMBULANCE. In 1993, London ambulance driver Tom Lynch was stuck in traffic on his way to a call when he started thinking about how much faster he could get there on a bike. Soon he was doing just that. In 2000, he started a bike ambulance unit that now handles thousands of calls a year. The bicycle EMTs cart a siren and a medical kit, and can handle most emergencies, freeing ambulances for other calls. 9. IT PROVIDES CHEAP, CLEAN POWER FOR LOCAL ECONOMIES. Carlos Marroquín was working as a bus driver in Guatemala in 1997 when he noticed people tinkering with old bicycles by the side of the road. He learned they were building bicimáquinas—pedal-powered machines for pumping water and doing other jobs that take hours by hand. The group hired him, and he later founded Bici-Tec, where his bicimáquinas have turned daylong water-pumping pursuits into tasks that take just minutes. 10. IT HELPS ALLEVIATE SYMPTOMS OF PARKINSON'S DISEASE. In 2003, biomedical engineer Jay Alberts was on a high-effort weeklong tandem ride with a friend who has Parkinson’s when the friend’s symptoms nearly disappeared. Alberts then studied a group of Parkinson’s patients who rode at an intense 80-90 rpm clip on a tandem bike, and had a 35 percent improvement in symptoms. Intense exercise can’t cure the disease, but it can temper it. For more stories from our 10 issue, click here. Subscribe to mental_floss magazine here!